There are many things to love about Summer and the warmer weather but for someone like me who will always hit the snooze button and enjoy an extra five more minutes in bed, one of those things is allowing my hair to air dry. As soon as I'm able to pack away the hairdryer, out comes the salt spray. The salt spray I'm currently enjoying is TIGI Bed Head Queen Beach Salt Infused Texture Spray* which has a gorgeous beachy scent which belies the train journey that lies ahead and it's made a nice replacement for my typically favoured Bumble & Bumble Surf Spray. My routine is simple; once my morning skincare and make up has been applied I spray a little Queen Beach, brush though, tousle a little, perhaps add another spritz and then walk out the door. In the current hot and him weather it's always a plus when able to avoid blowing hot air around adding to sticky conditions. I find TIGI Bed Head Queen less drying that Bumble & Bumble thanks to Balinese sea salt and marine algae extra. 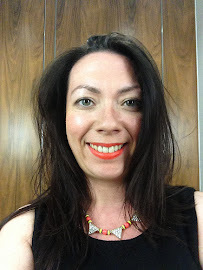 I do find that there's less texture for this reason but it creates the right balance for me on a day to day basis and is a nod to Summer whilst in the office but without looking like I have indeed stepped off the beach. Volume is not something I look for from salt sprays but because it is less drying and I am using after a regular shampoo I find that my hair doesn't lose it's natural volume and the subtle texture means my hair looks healthier rather than crispy. As for the packaging it's cute to look at but the circular shape is a little troublesome and would be a nightmare to slot neatly into a make up bag - and no chance in hand luggage but thats a minor gripe and I can always decant. Are you a fan of salt sprays? Pretty much what it says on the tin. A textured spray which gives the same affect of beachy waves as if you just stepped out of the sea!